Since your La Jolla employees are your most valuable company asset, you should be doing your best to keep them from running down. 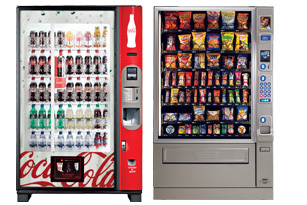 Partnering with Munch a Bunch Vending can help you get them the food and refreshments they need at any time of the day. 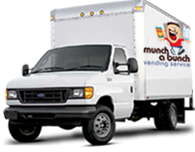 We offer both full service vending and office coffee services from Munch a Bunch Vending of La Jolla. Our vending machines are new, stylish, dependable, offer a number of payment options, and are installed, filled, kept full and maintained at no cost to your La Jolla business. Keep your employees on the job with the food and beverages they need to keep at their jobs right in the workplace. If you have a large enough need, we can also install your very own convenience store with one of our customized Micro Markets. Improving the break room atmosphere will greatly improve morale and production. When you have Munch a Bunch Vending handle the office coffee needs of your La Jolla business you'll start seeing a difference immediately. We'll bring in brewing equipment, name brand coffees and teas, filters, cups, plates, napkins, sweeteners, sugar, creamers and stir sticks fully stocked to keep coffee flowing and employees going. No need to make a coffee run, great coffee is right in your break room, 24 hours a day. Munch a Bunch Vending also installs plumbed in water filtration units in your La Jolla business. With our service you can get instant, unlimited hot and cold filtered water directly from your tap – something your employees will be grateful for. Get started today. Contact Munch a Bunch Vending at 760-480-0870 or send an email to mabvending@yahoo.com and an account manager can start transforming your location today.